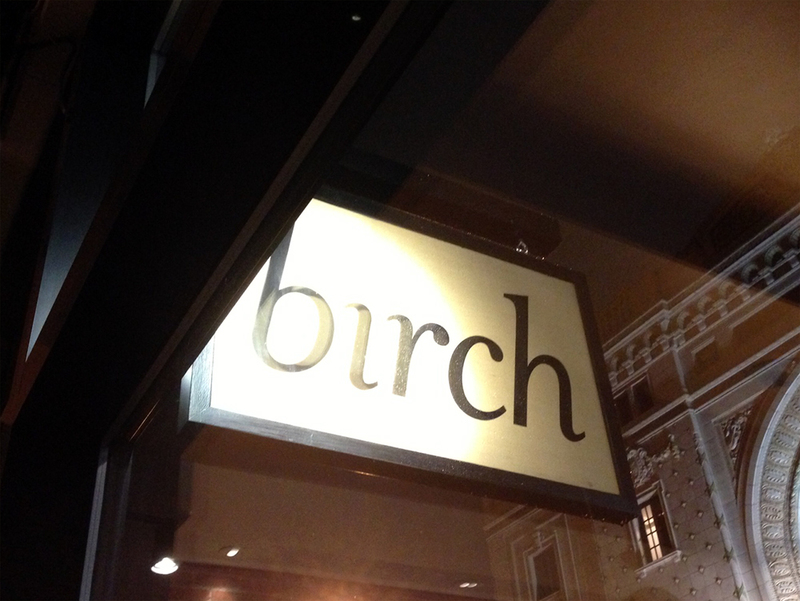 Birch opened up in June 2013 and I finally had a chance to visit the restaurant when I went there to eat with friends. When I entered the restaurant, I wasn’t ready for how small it is. It basically only seats 16-18 people around a U-shaped bar. 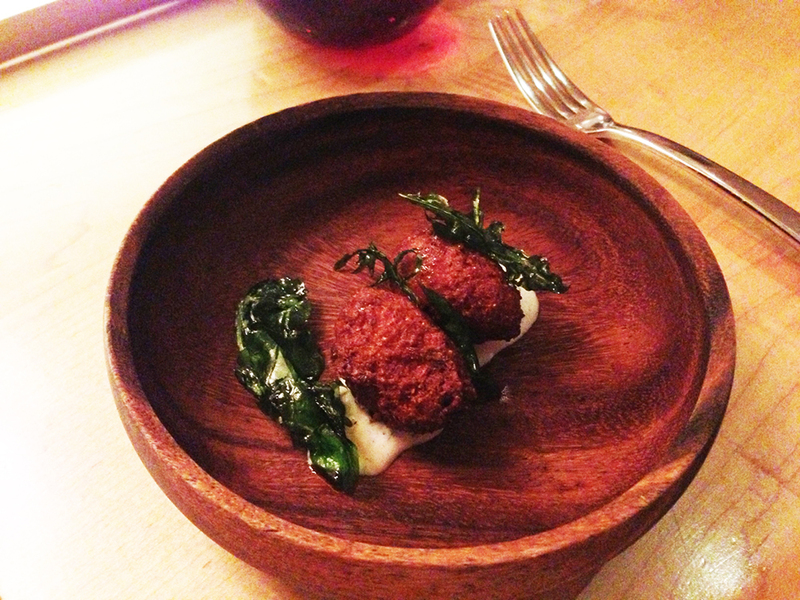 Nonetheless, this tiny restaurant, run by chef-owners Benjamin and Heidi Sukle, was very inviting. My friends and I all decided to jump in feet first and try the 4-Course dinner menu for $49 each. We weren’t disappointed. 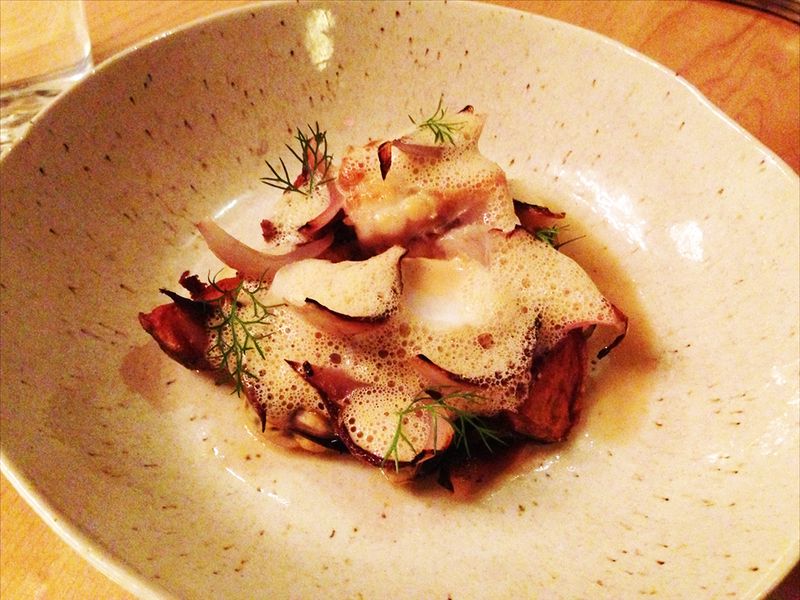 Birch is a tiny restaurant. It’s probably one of the smallest restaurants I’ve ever been in. The entire restaurant is about 500 square feet according to our server that night. Nonetheless, the atmosphere is very comforting while still remaining fairly modern and fashionable. There was a great selection of music playing very quietly that included Otis Redding and other chill artists. The music was there, but quiet enough that you would miss it if you weren’t listening for it directly. That makes the restaurant a great place to talk with friends, the servers, or even other guests seated next to you at the single bar where all food service takes place. The picture below captures almost the entire restaurant. The service at Birch is fantastic. Our two servers were helpful, and conversational while not intruding on guest conversations. The whole attitude of the restaurant is relaxed and friendly. I started off the evening with a cocktail. I wanted something with vodka and narrowed it down between the slightly more bitter grapefruit cocktail called the “Goodwin” or a sweeter lemon-based drink called the “Goosefoot.” I went with the Goodwin after the bartender explained the choices. 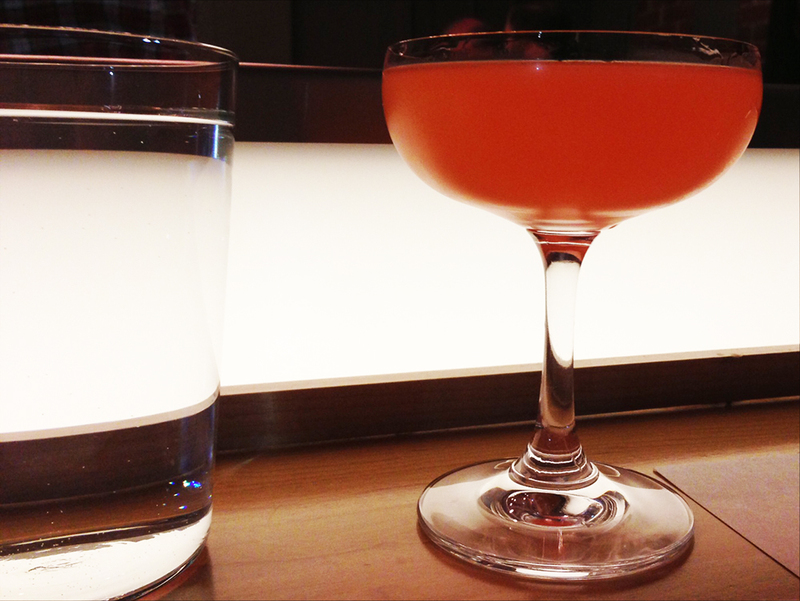 It was just as described – a light, bittersweet grapefruit cocktail that started out the evening well. For the first course, my fiance, Sophia, ordered the spaghetti squash and I ordered the raw scallops. 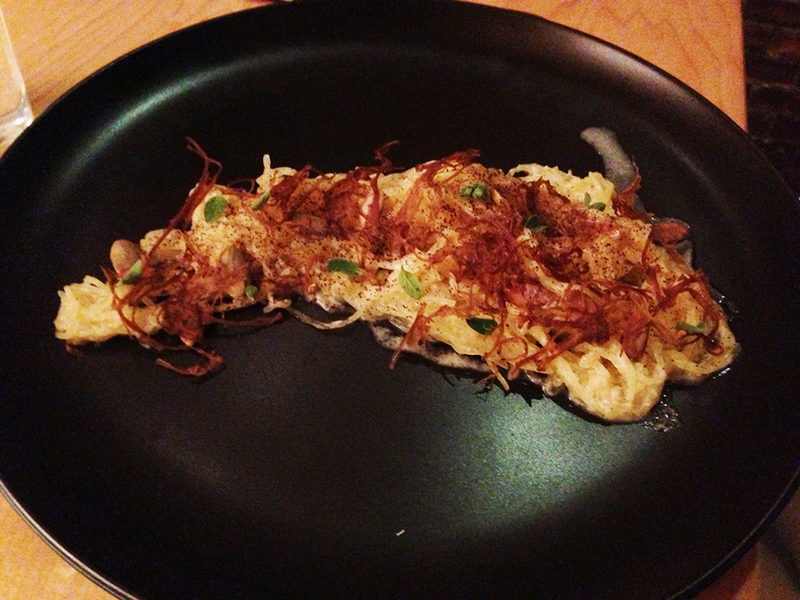 The spaghetti squash (also with enoki mushrooms, pumpkin seeds, marjoram, and sour cream) was fantastic. I was very surprised at how flavorful and hearty this dish was. The ingredients combined very well along with the richness of the sour cream, which tied them together. I was hesitant about the raw scallops (dressed with avocado, toasted sesame, radish, and bronze fennel) at first because I’d never really had raw scallops before. Nonetheless, as a sushi lover, I went full steam ahead and ordered them. As expected, they were delicious and incredibly fresh tasting. The sesame seeds gave the dish a slightly Japanese flavor, while the radish added a surprising twist to the dish. When i think of seafood, I rarely think of radish, but the mild yet tangy radish slices complemented the scallops perfectly. In between the first and second course, our server brought us complimentary hush puppies. The little oval bites of fried cornmeal were crumbly, but not dry and served over a dill yogurt or dill mayo sauce alongside crispy leafy greens. This was a welcome addition to the start of the email. The second course consisted of a Warm Beet Salad (served with walnuts, sunflower seeds, currants, and caramelized onion) and the Pierogies for me. The beets tasted fresh and, well, like beets. The other ingredients worked well with the whole dish, but the firm sunflower seeds didn’t quite fit in my opinion. The Pierogies (served with raw Hooligan cheese, barbecued scallions, homemade mini-potato chips, and dijon mustard) I ordered were really excellent. The mild cheese inside the pierogies was soft with a velvety mozzarella texture. 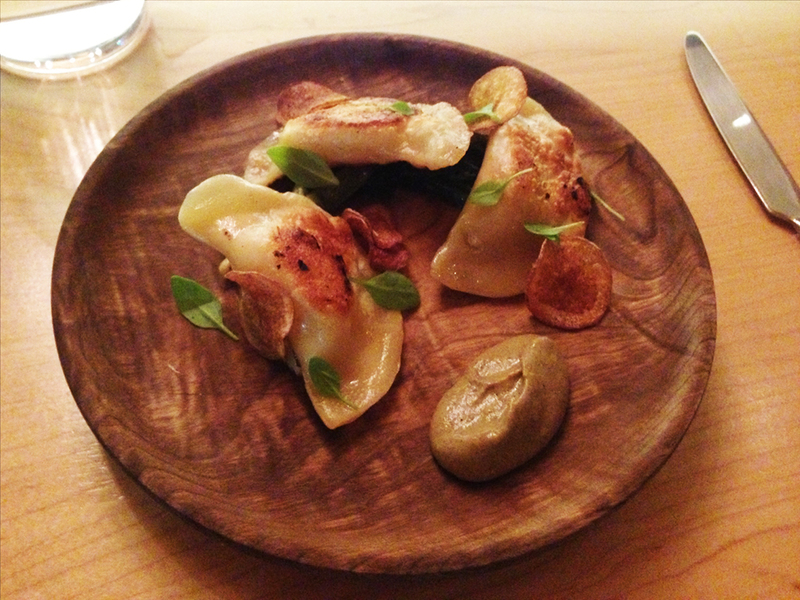 The pan sear on the outside of the pierogies added flavor as well as a crispy texture compared to the soft cheese. The bed of barbecued scallions seemed a little random, but they were delicious in their own right. I also really enjoyed the homemade mini potato chips. The mustard that came with the dish was also pretty good, but I stayed away from it because I thought that it overpowered the great flavor of the pierogies and mild cheese. I was conflicted when it came to the third course because I wasn’t sure if I wanted to try the Point Judith Monkfish or the Rhode Island Suckling Pork. Sophia made it easy for me because she went for the Monkfish, which left me free to get the pork and mooch off of her plate. The Point Judith Monkfish (served with grilled mussels, heirloom potato, caramelized onion, and brown butter) was pretty good, but overall I found it to be the weakest dish of the night. The monkfish itself tasted alright and was cooked perfectly, but the grilled mussels didn’t really taste very fresh. I also wasn’t a big fan of the the foam that covered the dish. In general I’m not a big fan of foams. I find them to be a somewhat silly trick to try and liven up a dish, when really all you get is a weird bubbly texture that eventually just turns to liquid. In contrast to the monkfish, the Rhode Island Suckling Pig (served with apples prepared three ways, sunchoke, and lemon verbana jou) tasted as good as it looked. All of the food served at Birch was presented immaculately on the plate, but the detail and precision that went into assembling this dish blew my mind. The raw apple slices on top were arranged and sliced with staggering care. Underneath them were three rows. Two rows of fall-apart-tender pork crisped on top and bottom and one row in between them of balled, alternating, apples and sunchokes. Underneath all of that was a very fine layer of pureed apple. Our server then poured a bit of the lemon jou over the entire dish. The jou immersed the ingredients in essentially a pork essence. This was a 3 x 3 masterpiece. 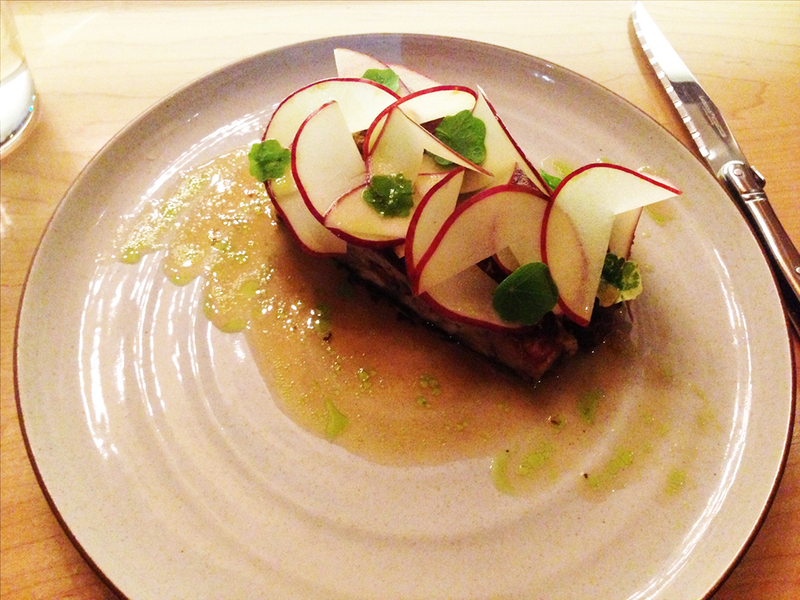 The different combinations of the preparations of apple with the pork created similar, but new tastes with each bite. The thin crispy outside of the pork and shape of the two strips of pork reminded me of eating excellent pork belly. Great dish! For dessert, Sophia tried the Sweet Grain Cereal (served with quince jam, honey, toasted grain milk, and all over a johnny cake). The milk in this dessert was also pretty much a foam, but in this case it worked really well. The best way to describe this dish was like eating a honey, nut, and grain cereal like the kind kids grow up with, but ratcheted up a notch on the gourmet scale. 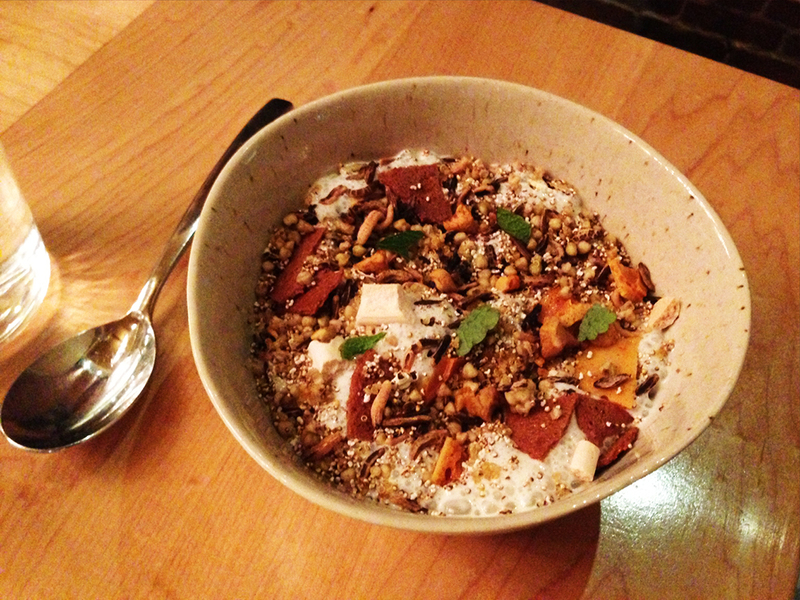 The flavors were very comforting, like being young and just enjoying a bowl of cereal. The johnny cake (cornmeal pancake) at the bottom added a substantive and delicious corn flavor to the whole dish as well that simulated cornflakes, but soft and fluffy instead of hard and crispy. My dessert was the Triple Chocolate Pudding. When I read the name, I thought the name described a really chocolatey pudding. I didn’t realize that the triple chocolate meant three different kinds of chocolate! 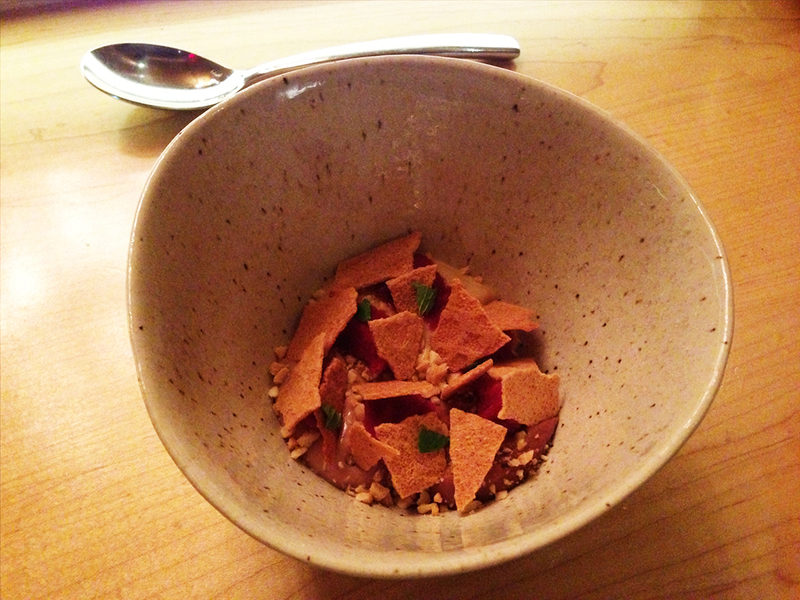 The dish had a white chocolate pudding, a milk chocolate pudding, and a dark chocolate pudding served along with oat snaps, elderberry sorbet, and peanuts. I thought that right off the bat, I would prefer the dark chocolate pudding. As it turns out, I actually liked the white chocolate pudding the best… and I generally hate white chocolate! The dark and milk chocolate puddings were good (especially the texture), but I found them a little bitter. Perhaps the chocolate wasn’t sweetened enough, but even though I don’t have a big sweet tooth, I would have enjoyed them more if they were sweeter. 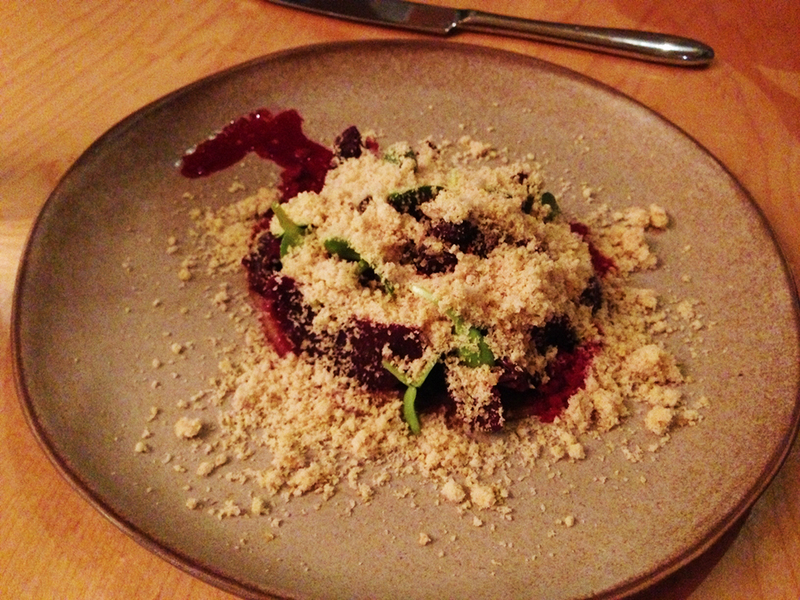 The white chocolate along with the elderberry sorbet was really incredible. I could have eaten just that on its own, which was surprising. The oat cakes added a nice crunch to the dish as well even if they weren’t packed with flavor. 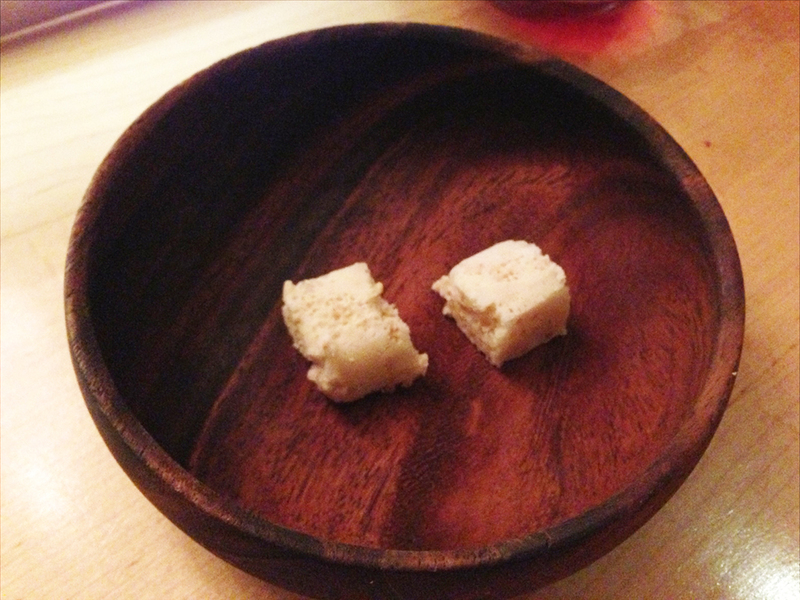 Lastly, our server treated us to a complimentary treat at the end of the meal which consisted of aerated white chocolate. Again, I’m not a big fan of white chocolate, but the chefs at Birch surprised me again when I found myself enjoying this little firm block of sweet white chocolate. 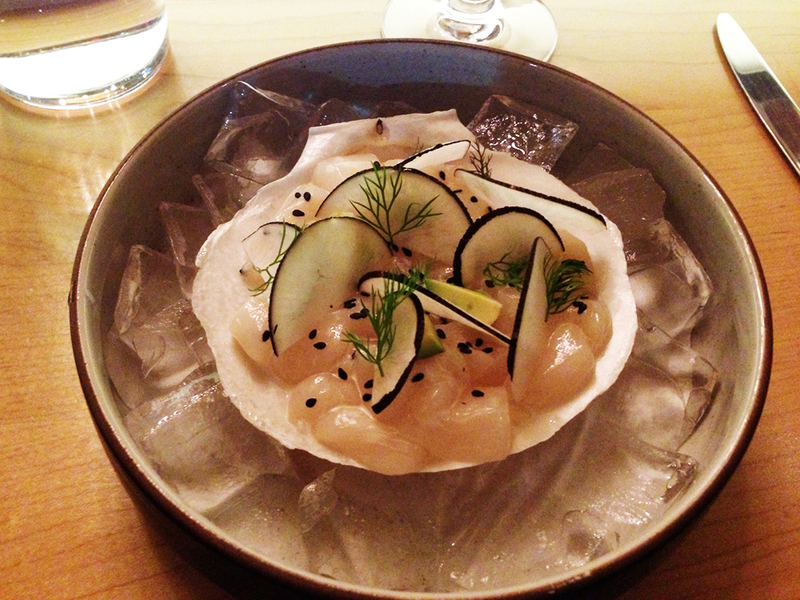 I greatly enjoyed the 4-course dinner at Birch. Not only was the presentation of every plate stunning, but the flavor combinations and quality ingredients made for a memorable night. 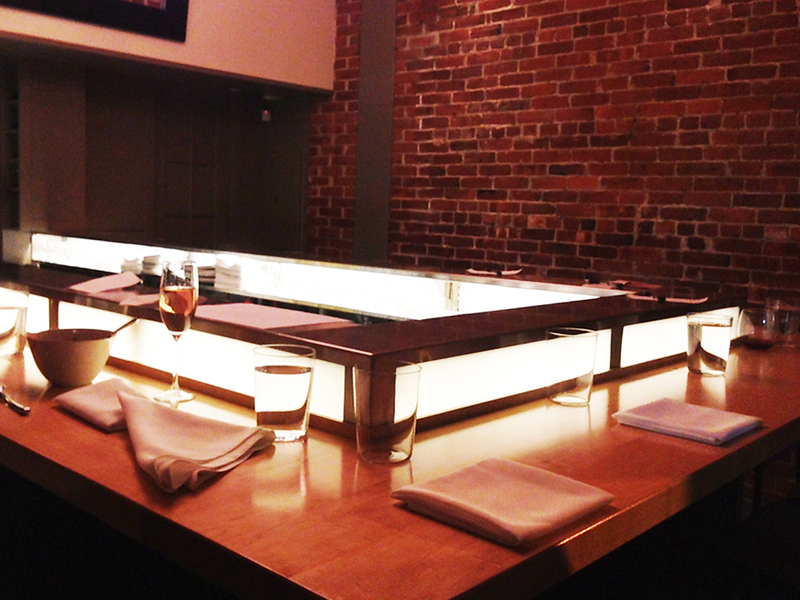 The small, cozy restaurant interior is inviting, so enjoy it while having a leisurely meal over a couple of hours. I would highly recommend this somewhat new restaurant, but be sure to make a reservation. The highest praise I can give is that they make white chocolate taste good.